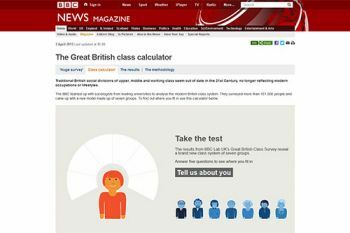 The BBC has published the results from the 'Great British Class Survey' which has revealed a new model of social class with seven categories ranging from the Elite at the top to a 'Precariat' at the bottom. A total of 161,458 people from around the UK completed the survey on the BBC website, which was launched in early 2011. The majority of respondents (86%) lived in England while 8% lived in Scotland, 3% in Wales and 1% in Northern Ireland. The analysis of the survey's results, which has also been published as a paper in the Sociology journal, was conducted by a team of academics from around Europe, including Dr Sam Friedman from City's Department of Sociology. The team devised a new way of measuring class, which doesn't define class just by the job that people do, or the educational qualifications they hold, but by the different kinds of economic, cultural and social resources or 'capitals' that people possess. Dr Friedman, said: "It is very rare for surveys of this kind to elicit so many responses and the sheer volume of data has enabled the team to have a rare insight in to the social make-up of British society. "The class categories are only one of many outputs that come from this study.The team will continue to analyse the huge amount of data at our disposal." The research team, which was led by Professor Mike Savage from the London School of Economics and Professor Fiona Devine from the University of Manchester, included; Niall Cunningham, Yaojun Li and Andrew Miles from the University of Manchester, Mark Taylor from the University of York, Sam Friedman from City University, Johs Hjellbrekke from the University of Bergen, Norway and Brigette Le Roux of Universite Paris Descartes, France.